Fat on the underside of the arms is extremely visible and appears heavy, especially in fitted or short-sleeved shirts. Fight back with CoolSculpting arm fat reduction and get rid of ugly “bat wings” that make your body look heavy and unattractive. This simple, revolutionary procedure erases an average of one and a half to two inches off of each arm during the treatment period, leaving patients with a more toned, slender appearance. * Why continue to work at arm toning exercises that aren’t making a difference in arm fat reduction when this pain-free procedure can? Stop frowning at bat wings the mirror and discover how easy it is to get wow-worthy arms with CoolSculpting by Zeltiq at Sensational Skin in Scottsdale. The muffin top – a bulge of fat that squeezes out of the waistband – is an all-too-common fashion faux pas. Even in dresses or skirts, this unwelcome fat will ruin an outfit and draw attention to your stomach and love handles. With CoolSculpting, that ugly muffin top and love handle padding will melt away and leave you with a smoother, more contoured appearance in the tummy area. * After a treatment in our Scottsdale office, your favorite clothes will fit better and you’ll personally experience the boost of self-confidence that this painless, non-surgical procedure offers through impressive results. For men, reducing body fat bulges can be a very difficult process, especially when the problem area is a stubborn spare tire on the belly. When diet and exercise fall short, finding an alternative to liposuction in Scottsdale is as simple as scheduling a CoolSculpting session. At our Scottsdale office, we recognize that men want to look great too, and the first step is slimming down the spare tire to give our male patients a smoother, more contoured look to their midsection. This procedure can be performed during a lunch hour and will improve your self-esteem and attractiveness without impacting your work or social schedule. 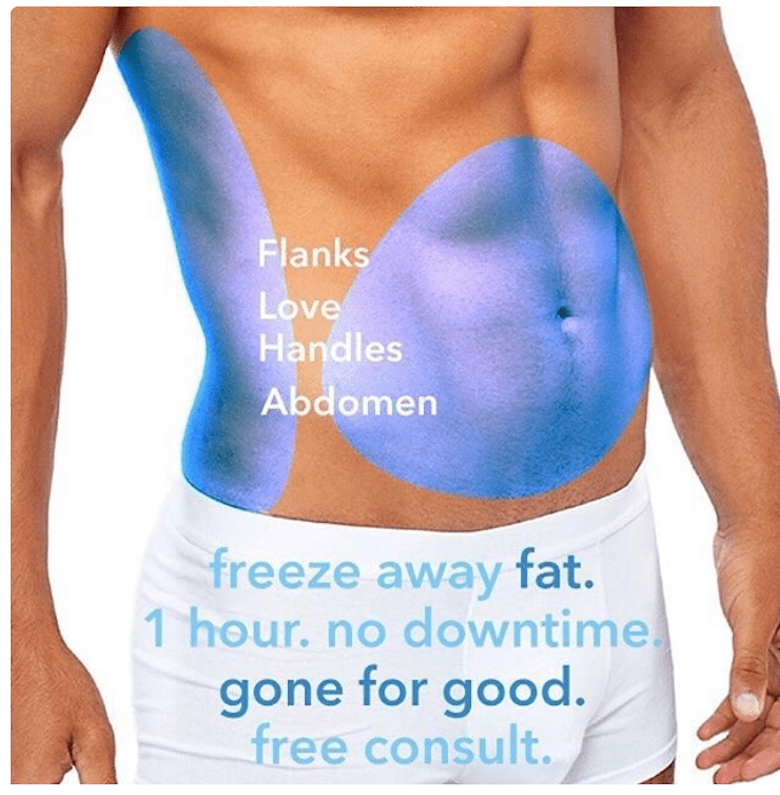 With the power of CoolSculpting at Sensational Skin, you can freeze the fat from the abdomen and love handles at the same time with multiple machines and our new CoolAdvantage applicators. The new applicators allow patients to treat both love handles in 35 minutes. Versatile. As one of today’s most versatile cosmetic treatments, CoolSculpting can target nearly any area of unwanted fat. Common treatment areas include the abdomen, thighs, saddlebags, inner thighs, love handles, arms, chest, waist, and back. Our CoolSculpting experience is extensive, with continued progress in fat reduction on new body areas. The reason for this, is our past CoolSculpting patients ask us to treat new areas. We share our experience with you to develop the most effective CoolSculpting treatment plan to accomplish your goals. Our Exclusive CoolSculpting Suites. Our practice has two CoolSculpting Suites. Our CoolSculpting Suites are equipped with large comfortable beds, large TV's with the latest movies, and healthy snacks and drinks. Many of our patients will come in for a full day of CoolSculpting treatment using all four of our machines to treat the full body at the same time. We Have All CoolSculpting Applicators. We always have the most up to date applicators to maximize your treatment results. We have 30 Applicators, 4 machines, muscle conditioning with emsculpt, and skin tightening technology. Skin Experts. During your consultation we frequently discuss other options many patient’s have regarding skin tightening, cellulite, skin pigmentation, and aging skin. We offer the most effective non-invasive treatments for the body, face and skin. Experts Technologies. Sensational Skin is a leading center in the most innovative non-surgical options for face and body. We are proud to be the first to offer Profound Micro Laser facelift in Arizona. Medical Doctor on site. Dr. Brown is available to discuss specific medical conditions or medication concerns regarding coolsculpting procedure. Many patient’s have unique medical needs that require Dr. Brown’s evaluation. Read What’s The Difference between Fat Reduction and Losing Weight?